Professor Kurt Marquart's book The Church and Her Fellowship, Ministry and Governance is going to be released for Ukrainian readers in October. The book has been transaled into Ukranian and will be an excellent tool both for theologians and laymen. Dr. Marquart, who has been taken by the Lord to His heavenly home 3 years ago, has been a beloved teacher to many Ukrainian Lutherans as wel as he has been very instrumental in Ukrainian Lutheran Church revival after she was physically exterminated by Communists in 1939 and 1944. As a new academic year at secular schools in Ukraine begins, Ukrainian Lutheran Church congregations continue to teach children at their Sunday Schools. Volunteer teachers - mature Christians of different ages share the Gospel with children, ages 3 to 14. The Lord, through the Lutheran Heritage Foundation (http://www.lhfmissions.org/), provided our church with 3 types of books for children of different ages. My First Catechism (in the Ukrainian language) is the most recent publication of the Lutheran Heritage Foundation for Sunday Schools in the ULC.To make teaching more interesting, attractive and applicable, craft materials are used by our talented teachers. Sunday School Education is vital for Ukrainian kids since all the day schools are filled with atheism and evolution. For some of the children our Sunday School time is the only time in a week they can hear of the Lord Jesus Christ. 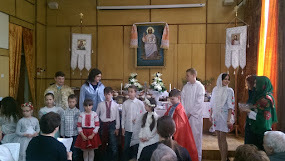 Please pray this week for the Sunday Schools of the Ukrainian Lutheran Church. Picture: Kids from the youngest group of the Sunday School in the Resurrection Lutheran Church in Kyiv. Ukrainian Lutheran Church is a member of the All-Ukrainian Church Council (AUCC). This Council does not promote joint prayers, worships etc. The main task of this Council is to promote freedom of confession and defend churches' rights in Ukraine. On September 3, 2009 a meeting of the AUCC Secretariate. Ihor Rudzik, the Ukranian Lutheran Church Secretary took part in the meeting. Church-state relations were reviewed and were evaluated well. Two Ukrainian government decisions make life of churches easier now: 1) foreign missionaries can stay without any additional trouble as long as their religious visas (P-visas) last and 2) natural gas prices for churches are at the level of prices for common citizens. In Ukraine profit companies pay for natural gas more than common citizens. Till recently churches had to pay the same price as commerical companies, although churches are non-profit organizations and their "incomes" are usually offerings and donations of common people. Natural gas is the main source of heating energy in Ukraine, where winter can start in November and last till April. The above mentioned decisions were made after the AUCC members, including Bishop Horpynchuk, had a meeting with Mrs. Yulia Tymoshenko, the Prime-Minister of Ukraine, in August 2009. Ukrainian kids are back to their schools. Ukrainian Lutheran Church has no Christian day schools - all the children have to study in secular schools, colleges and universities. It's a challenging job, since many teachers and professors are atheists and sometimes they mock believers in Christ. We use any opportunity to spread the Gospel and encourage our children to be faithful to the Lord. Last Sunday our pastors were blessing children in their congregations as the new academic year was beginning on September 1. Our confessional Lutheran pastors were preaching Christ crucified and encouraging children to be faithful to their Lord, be obedient to parents and teachers, and to spread the Gospel. On September 1, Bishop Horpynchuk was invited to participate at two events in Kyiv: to be the parents' speaker at one of the central schools in Kyiv and to bless students of the Wisconsin International Univeristy in Ukraine (WIUA). The Bishop shared the Gospel at both places and presented a collection of Lutheran books (sermons and People's Bible Commentaries in Ukrainian) published by the Lutheran Heritage Foundation to the WIUA. Our phone and fax number is +380-44-2340804. Please write and call. We still need some time to organize our working space to invite you to be our guests and share a cup of coffee with us!